Imagine if you could see what your new smile will look like before we begin. We are not talking about a touched-up photograph. We are talking about a way for you to see your very own face, in the mirror with your new smile in place, before you commit to investment in your perfect smile. The Trial Smile allows you to see, and experience, the artistic touch that distinguishes Dr. Hagood from other esthetic dentists. Trial Smile also allows you to see your own face in the mirror with your perfect smile before making a significant investment. The temporary composite veneers are easily removed. Dr. Hagood is one of only a few dentists who have developed expertise in “The Trial Smile” procedure, and he performs it on a regular basis. He can expertly and artistically create composite veneers and temporarily overlay these on your natural teeth. The procedure does not permanently change your teeth, is completely comfortable, and can be accomplished on your very first visit for a smile makeover consultation. 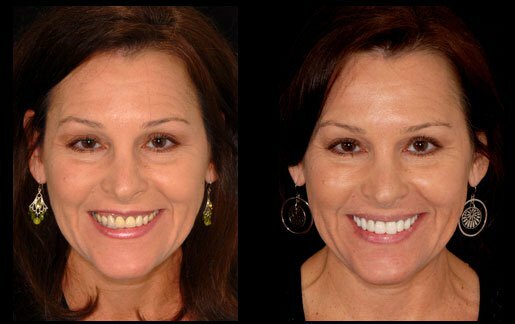 The temporary veneers are easily removed before you leave, but he will take a series of before and after images for you to take with you. Here is a sample of one of the photographs that are taken before and after The Trial Smile procedure. After your photographs are taken, you can take a copy home, and Dr. Hagood will have them to assist in planning your definitive treatment, should you desire to proceed with treatment.